Beating my fear of running in the dark! Unfortunately as Game of Thrones predicted ‘Winter is Coming’! With the first of October rolling in without warning I think I have to accept that the long sunny(ish) summer days are over, and while I am not yet resorting to the heavyweight down jackets and thermals, I am putting the short shorts away for another year. Hand in hand with this comes the dark and slightly bleak winter evenings. It’s time to get out the headtorch and embrace the night running again. This winter I have a goal. Aside from making sure I continue to get outside regularly, I want to overcome my fear of the dark! At the age of 25 you would have thought I would have grown out of this by now – but believe it or not, I still get nervous when I am by myself. Heading out fell running in a group I am absolutely fine, and likewise, road running in town (bleurgh) is also not an issue. However, put me in the middle of the hills on my tod and I really have to push myself to get out. In my mind, it seems highly likely something or someone is waiting to jump out at me… The reality of the situation is that there is probably not some random waiting on the top of a cold, windy hill about to pop out and say ‘Boo’! So how do I conquer this? Friends who are as mad as me! It’s worth pointing out at this point this is not a ‘how to’ post… I’ve not solved this one yet – it’s work in progress, and I will have to keep you updated. The theory behind this is that if I head out before sunrise, I know it is going to be getting lighter (and therefore less scary!). Then as I get more accustomed to running by myself, I can then extend the amount of time I run before the sun comes up. Plus this has the added bonus that sunrises are stunning and an excellent way to start the day – you just feel so productive! The sun is up – I survived! 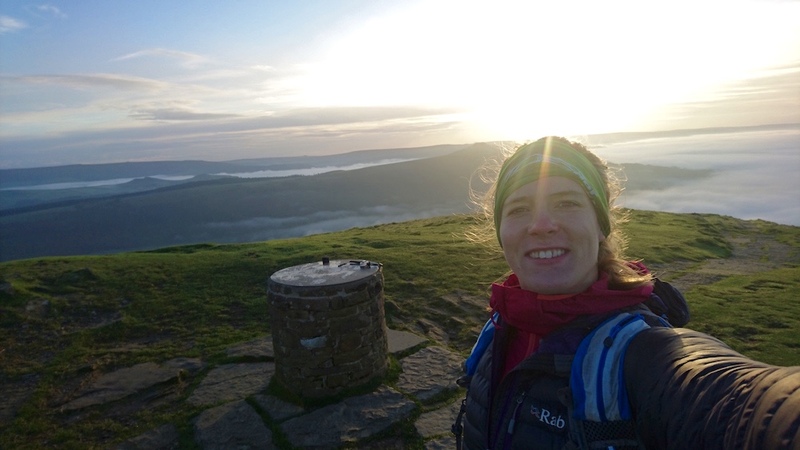 So just below is a little video of my first sunrise run from Mam Tor to Lose Hill (and back). I’m not going to lie getting out of the car was a tiny bit daunting, but it was well worth the effort. I would be really keen to hear if anyone had any tips or tricks – or if anyone even feels the same? Is it just me?! Trying out my new shoes! Good stuff, that sunrise looks ace! I think it's natural to feel a little apprehensive heading out when everyone else is tucked up at home. If you're near Sheffield, Steel City Striders have an unofficial head-torch group that run most weeks, usually on a Wednesday or Thursday. We run at a very inclusive pace on routes from 6-11 km, you don't have to be a Strider to come along and we're super friendly and keen to welcome new runners to the group. If you're interested, you can find details of the next weeks plans on the Steel City Striders' facebook pages.